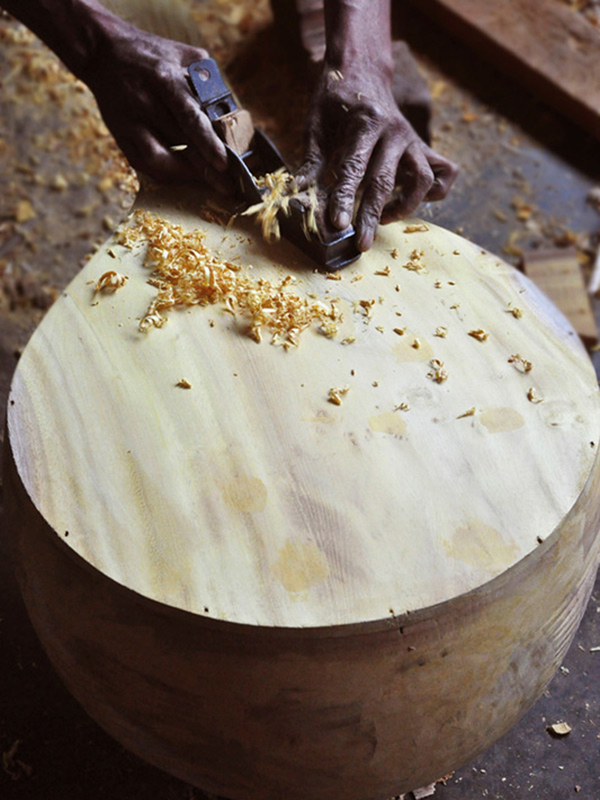 Jack wood is cut into basic shape of veena. 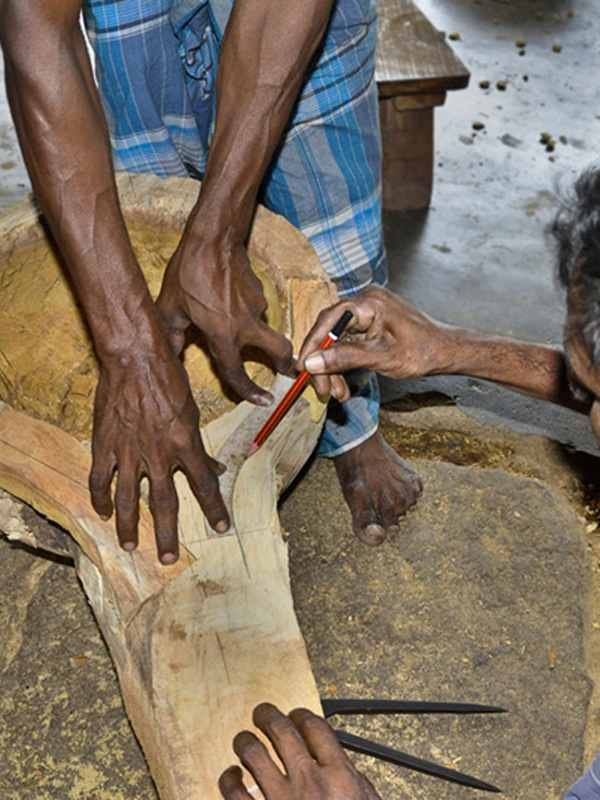 Measurements are marked for the exact shape of the veena to be carved. It takes 2-4 days to make one complete veena. The wood surface is smoothened by scraping. 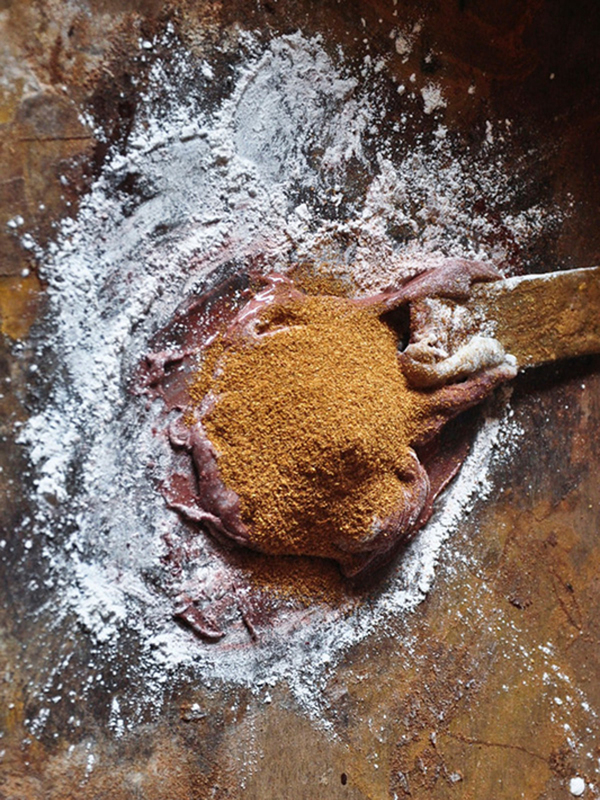 Mixture of jack wood husk, pop powder, yellow color powder and adhesive is made. The wood husk mixture is applied on the wood to fill the cracks. 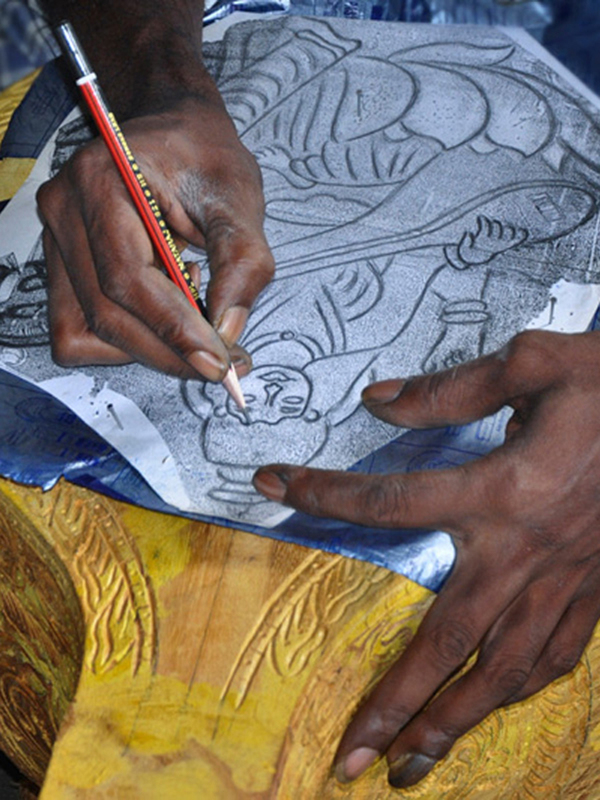 Rough sketch of the design to be carved is traced on the veena. The design is carved using chisel and wooden mallet. A decorative piece called yalli is attached at the end of the neck. Pegs and knobs are fixed to the veena’s neck. A coat of thin solution made of pop powder, adhesive and yellow color powder is painted to hide the crack patches. Carving and fixing of veena parts are complete. Veena is a traditional and classical musical instrument of India. Music and dance play a vital role in the cultural life of Tamil Nadu; Veena Playing is one among them. 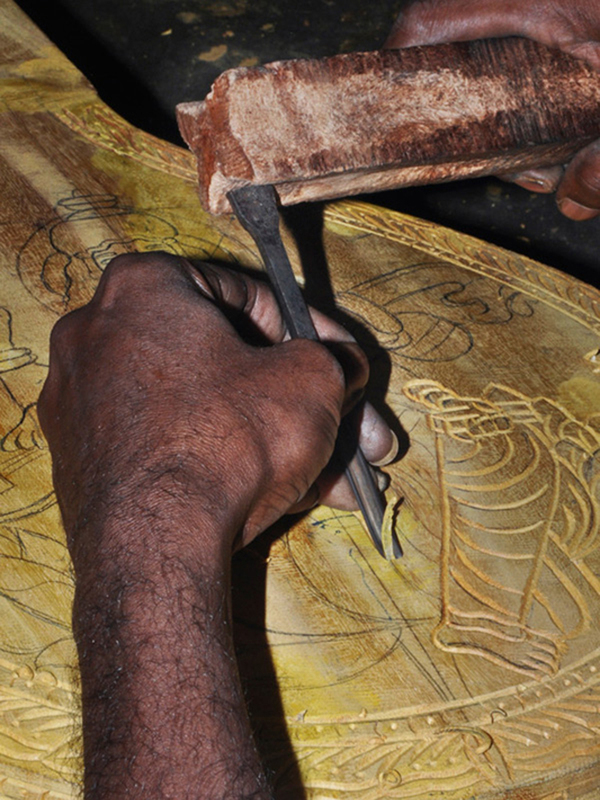 Hence, veena making has become major craft of Thanjavur. 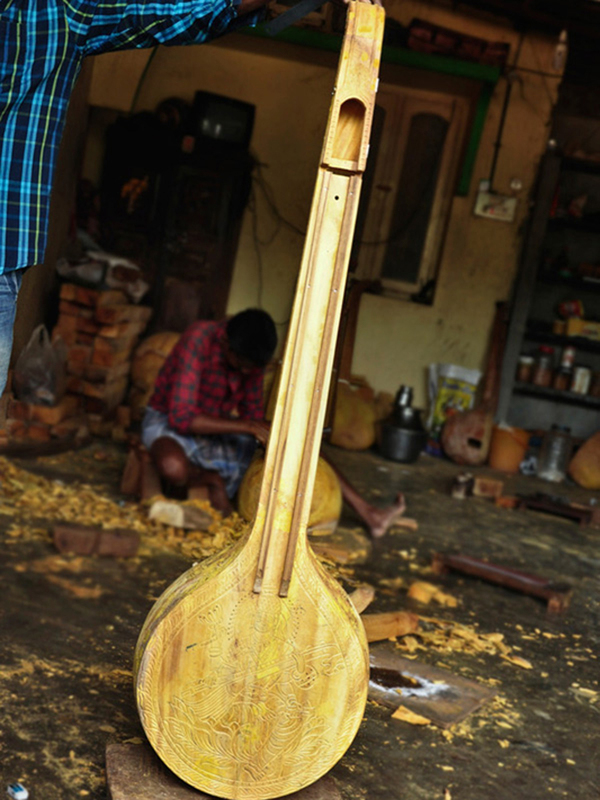 The veena is four feet in length consisting of a large resonator (tumba), a wooden bridge (Mettu), a tapering hollow neck (dandi), a smaller non-functional resonator and seven strings of the Veena. 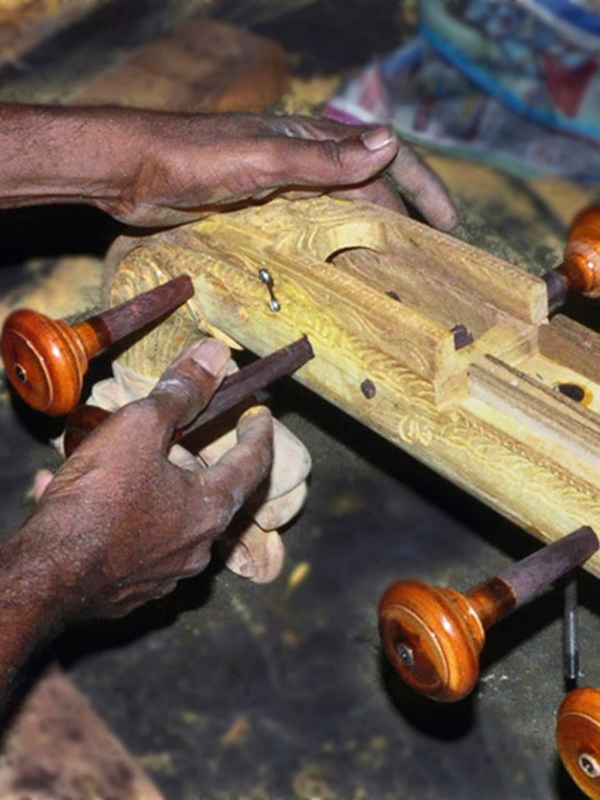 Veena making process involves many stages with team work of artisans. 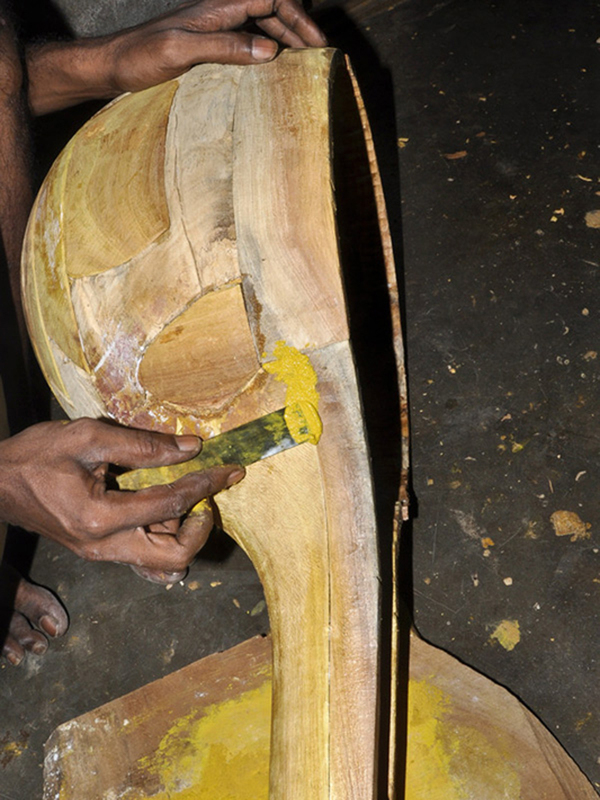 The traditional instrument making process begins with carving a single log of wood into veena’s base. 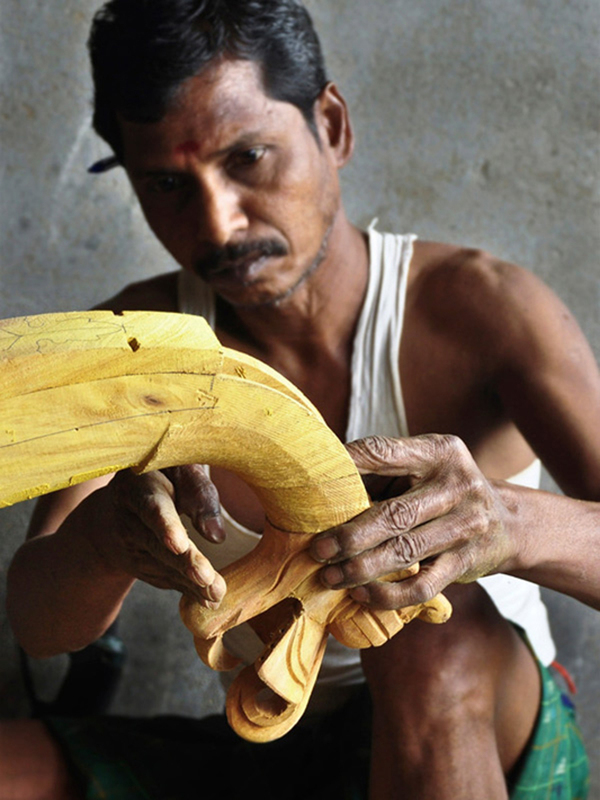 Jackfruit wood is used to make the veena. 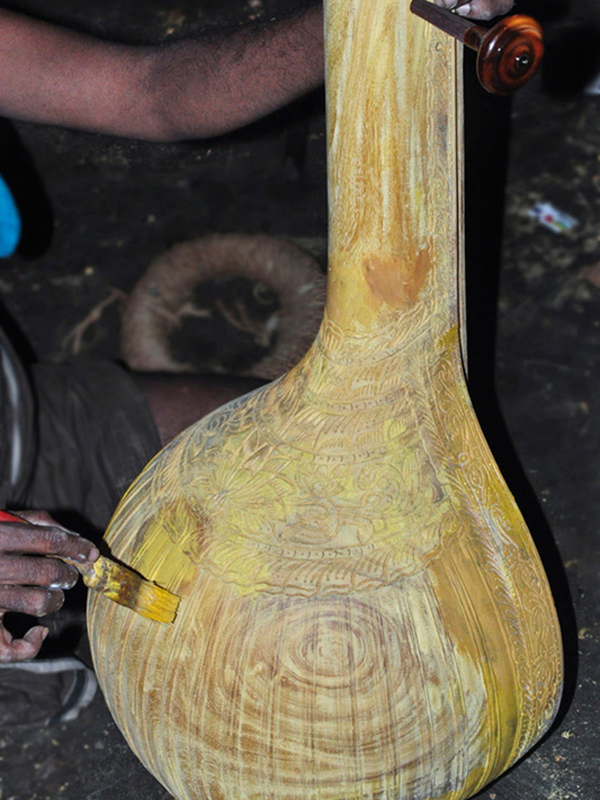 The process of making veena is very much precise and it takes at least 3 to 4 days to complete one complete veena. 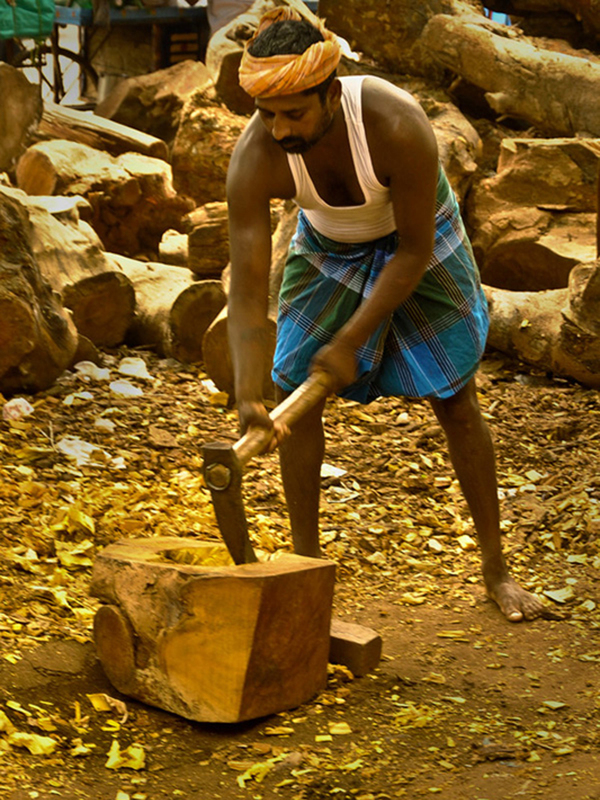 Jackfruit wood (Pala Maram) is procured from market and kept for seasoning and maturing. 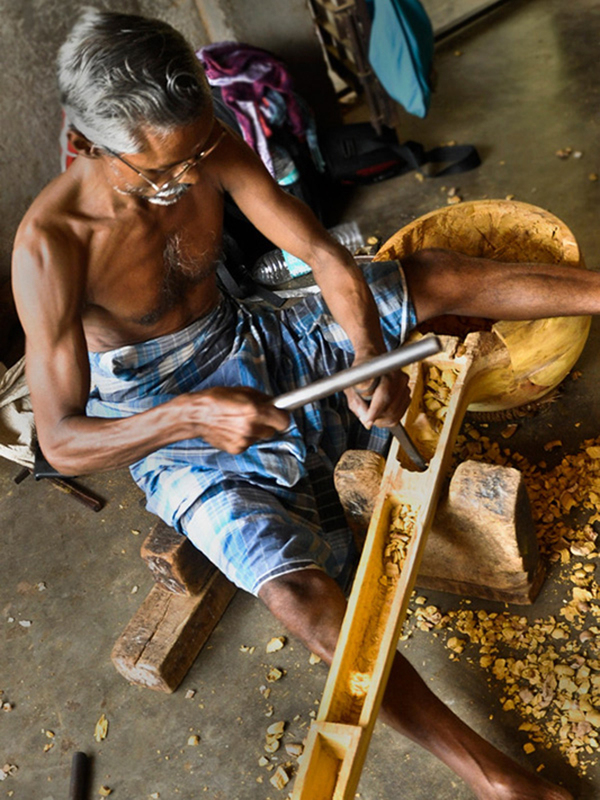 Jackfruit wood is easy to carve when the wood is moist; once the wood becomes dry it’s hard to carve with it.